Just north of Edinburgh and nestling on the shores of the Firth of Forth, lies the little town of South Queensferry which has a population of around 12,000 people. Queensferry has been blessed with one of the loveliest high streets, lined with ancient inns, shops and churches, including the 15th century St Marys Episcopal Church. 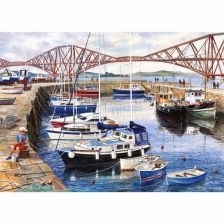 Looking across the towns walled harbour, there is a fine view of the Forth Bridge completed in 1890. In a unique annual pagan-like ritual, a local man is covered from head-to-toe in sticky burrs, with a floral hat and a waistband sash. The Burry Man is then paraded through the town, refreshed with whisky and supported by two attendants, whilst children rush from door to door collecting money on his behalf. Gibsons jigsaw puzzles are made from 100% recycled, high quality puzzle board.